We’ve always found that Steinberg’s UR interface series have proven to be solid options at their respective price points, normally proven to be extremely capable all-rounders with great pre-amps & signal path, as well as having a general tank-like construction. Production packs have always been popular with users who are just starting out and with this one we see what looks to be a complete solution for anyone wishing to get started with writing and recording music at home. Cubasis LE download info (this is the iOS version of Cubase LE, so user can also use the interface/mic/headphones on an iPad). But that’s not all! The bonus to be found within this limited edition pack is that you also receive a full copy of Cubase Artist edition 9.5 (including Elicencer) as well as a full copy of Wavelab Elements 9.5. 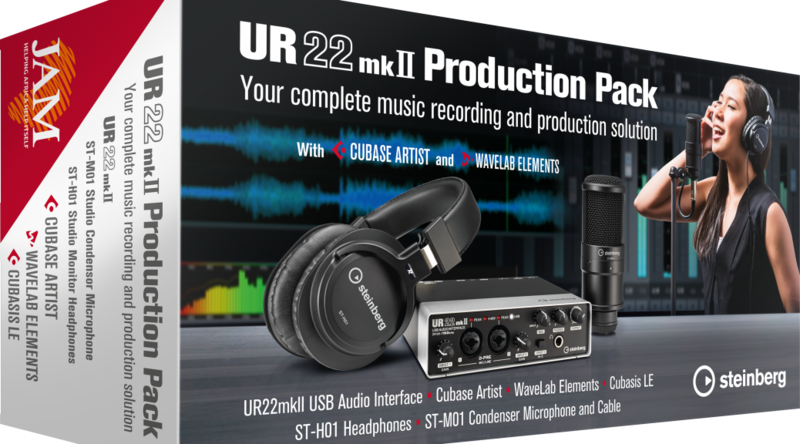 With the package expected to come in around £342 this pretty much equates to a free copy of Cubase Artist which in itself has a value of over £200, making this a superb deal for anyone wishing to invest in a complete solution to get going. The package is available for pre-order now and we are expecting to be shipping them over the next few days. Please be aware that this offer is extremely limited and won’t be around for long!